Where The Wild Things Are ← You Want Me To Wear What? I love Modcloth. Their clothes are, 80% of the time, absolutely adorable and unusual. Yeah, they end up on the site a lot, but that’s only because I spend so much time surfing it for clothes I want to buy, and it’s always striking when I find something that is unappealing. They made it too easy this time, though. 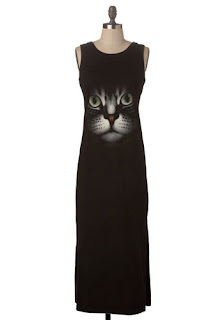 This dress is called the “Chest-ire Cat Maxi dress,” and what I hate most about it is that they spoiled my absolutely brilliant pun. 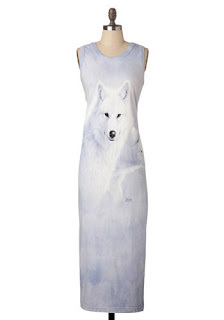 I guess you can wear this dress when your Three Wolf Moon Tee just isn’t formal enough. 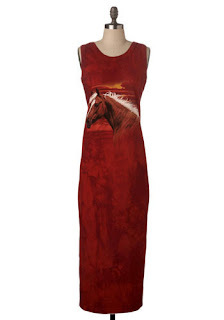 And this dress, I’m pretty sure, is available for purchase at that same store that sells the Native American-made blankets and dreamcatchers. I recently went on a road trip where we stopped at a gas station at 3 in the morning (probably Kamloops BC) and FOUND THE CAT DRESS. It was really exciting, and not just because I was seriously sleep-deprived. They also sold 3-wolf-moon-esque shirts and graphic tees whose designs can be summarized as “cartoon old men acting like hicks”. I’m sorry that I didn’t have a camera. That place sounds magical in its levels of tacky. I must go there.